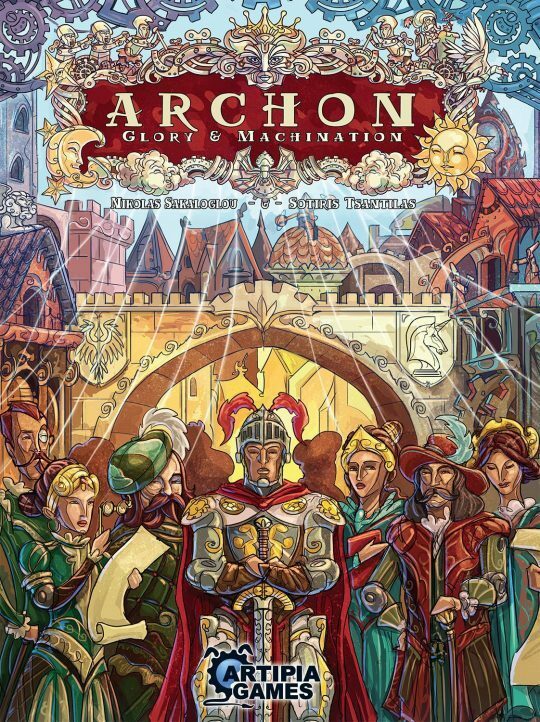 In Archon: Glory & Machination, players are powerful Archons who support Cardis in order to win King’s favor. Players use their influence on their Courtiers and on various figures of authority (Magisters). Each game consists of three Seasons. For each of these Seasons, the King issues different demands that players must fulfill in order to score Victory Points. Each season consists of 3 rounds during which players use a card-driven worker placement mechanism to perform various actions that will allow them to gather resources and income, recruit soldiers and, rebuild the city, and acquire scoring cards (Science & Arts). They will also have the chance to train Elite Warriors to assist in the city’s defense. After nine rounds, the game ends and the player with the most Victory Points wins.